Although it could’ve been expected that the 108-win Boston Red Sox would run away with the World Series, the Los Angeles Dodgers provided their fans with more than a few moments of pleasure along the way. 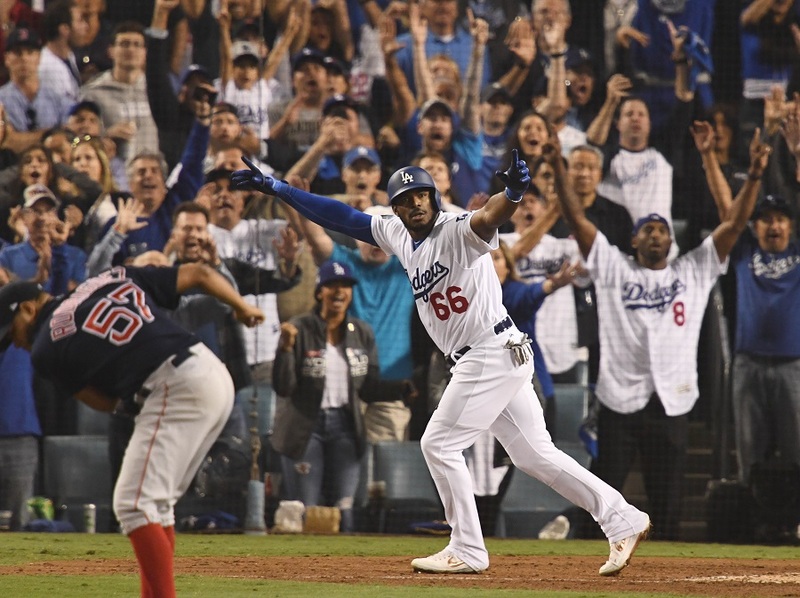 Chief among them was Yasiel Puig’s mammoth blast off Eduardo Rodriguez in the sixth inning of Game 4. Boston would go on to win that contest, but it was at the height of the jubilation that I found myself considering the Minnesota Twins' Miguel Sano. Back in the summer of 2012, Yasiel Puig was all the rage. A Cuban defector, he was looking for a big payday with a major league team. Ned Colletti inked the outfielder on a seven-year, $42 million deal. Puig, 21 years old at the time, had taken roughly a year off to go through the signing process (one which has many hurdles for players from his home country). With a list of suitors a mile long, Yasiel experienced the highs and lows of being an international free agent. In defecting from Cuba, Puig escaped by speedboat in the middle of the night. His handlers made death threats against him, and the journey to freedom through Mexico and eventually the United States was not one for the faint of heart. Even before debuting with the Dodgers on June 3, 2013, he had been put through the wringer. For Miguel Sano, the journey was a much more traditional one. The Dominican Republic is a hotbed of baseball talent and although Buscones still have plenty of shady tactics up their sleeves, the stories regarding death threats and necessary defection are few and far between. Sano’s eventual signing by the Twins came after hiccups regarding his age, and even included bone scans to verify the truth. Arriving in the organization prior to his 17th birthday, he’s had a much stronger support system throughout his professional career. Jumping back to that World Series moment for Puig, and where we are today with both players, the parallels between them are intriguing to say the least. In 2016, as a 25-year-old, Puig was sent packing by the Dodgers. In the three seasons prior, the Los Angeles outfielder owned an .858 OPS and had an All-Star appearance under his belt. A continuous slide in performance had become a yearly occurrence though, and the .740 OPS is where things bottomed out that year. Assigned to Triple-A Oklahoma City, the Dodgers were looking for their outfielder to improve “as a player and person.” Puig was recalled after 19 games at Triple-A, and turned in a .900 OPS for the Dodgers to wrap up the season. Since that point Puig has posted an .827 OPS over the past two seasons and has used his personality to fuel a competitive drive on the field. Less of a distraction off the field, the Dodgers once again have a difference maker on their 25-man roster. It was in 2018 that Miguel Sano experienced some of the same realities with the Minnesota Twins. An immense talent, one that was ranked as the fourth best prospect in baseball by MLB.com, the person came to be questioned. As production slid and weight was added, the level of commitment toward being great had become the focal point of Sano’s narrative. Needing to be a cornerstone for the Twins big league roster, the reality is that the organization simply couldn’t count on the level of production that would be given to them. Sitting at the same age of the demoted Yasiel Puig, 25-year-old Miguel Sano was sent packing. Needing to be watched over, given a support system, and be invested in, Fort Myers and Single-A was the landing spot for the Twins star. He too spent 19 games riding the bus, before a brief four game stint at Triple-A that would vault him back to Minnesota. We aren’t yet at a point to call this story complete, and while Yasiel Puig is two years removed from his adjustment, Miguel will enter 2019 at the age of 26. The next chapter in this saga comes down to Miguel and what he’d like to demand of himself. The Twins have all but played their hand, and Sano investing in himself provides the best path for his moment to still be in front of him. Yasiel Puig posted his best OPS since 2014 when he returned to the Dodgers full time in 2017. He didn’t garner the All-Star or MVP votes that came in his first two seasons, but he re-established himself as a cornerstone piece to a very talented active roster. How Miguel Sano prepares for 2019 will set the expectations that both he and the Minnesota Twins can establish for the year ahead. Currently at his lowest point as a professional, this is where there is great opportunity for the climb. Even if it ends up as a five game World Series loss in 2020 it’d be magical to see Miguel Sano take an opposing pitcher deep, toss his bat, and throw his hands in the air full of jubilation. At this moment that seems far-fetched, but there’s a blueprint and a path to follow. All the talent in the world resides on the side of Miguel Sano. The Minnesota Twins have made the commitment to him as both a ballplayer and a person. In 2019, it will be on the Dominican, and whether he wants stardom for himself or not. For all sad words of tongue and pen, the saddest are these: "It might have been". I was waiting for the other comparisons to Puig, like the off field behavior, attitude, showboating, etc..... which also fits like a glove. Sano is the Twins' Puig, in many ways. He has had Yasiel Moments.... just off the field. His off-season start with running over a cop's leg (accidently or not) at 3 in the morning outside a bar is not a great bump in the transition we are all hoping for. Perhaps the biggest failing these contracts have, and perhaps club policy, is not having a mandatory ongoing support seminar and cultural type of education schedule to help these too rich kids become a mature adult and player. Or something like that. I really hope that one day, an all-star selection is made from better critera than a hot first 2 1/2 months of the current season. Lots of players get exceptionally hot for a couple months, but are no where near a true all-star. There's still hope that Sano can become a Puig-like player in terms of offensive production.We're definitely at a point where consistent 120-130 OPS+ production out of Sano would be a significant win, both for him and the club. Also, interesting that the Dodgers didn't see fit to start Puig in 3 of the 11 games in the NLDS/NLCS rounds...and was replaced in a 4th.A 120 OPS+ (Puig 2018) and a great arm amounts to not much more than a nice piece when you have 5 OF options with better OPS+ than Eddie Rosario produced this year.And this a team that is not that close to being as good overall as at least 3 different teams in the AL. In the 3 full seasons since making his ML debut in 2015, Sano has played 116, 114, and 71 games.Trending in the wrong direction. Not only did the Dodgers send Puig down to get his head straight. So, who is in charge of babysitting this off season? And what's the over / under on Sano's weight day 1 of spring training? 280? If I’m being honest, I believe that by the time Sano actually has his “Yasiel Moment,” he’ll already be in another uniform. The weight I am looking for when he reports is 260....something, or less.If he is 275 or 280, he will be in better shape than last year, but will tell us he didn't go all out this winter to be the best he can be.Hopefully, he is making progress each time he checks in with the trainers at the DR Academy. The weight is not an issue if he is jacked and has worked out all winter. Sano is injury prone below the neck and undisciplined above the neck. I would like to know what Sano is doing at this very moment. My guess is he is not running a few miles after a resistance training workout. He can probably be found barely awake deciding whether to assume a vertical position or not. Sano has time to turn things around. He really just had one bad year, and it was bad enough that if he is going to have a wake-up call, this would be it. I still say he shouldn't be playing defense. We'll see if the new skipper agrees. Buxton should be a far bigger concern. Buxton's performance last year would have been career ending for 95% of players. But the weight will tell us if he has worked out all winter.It is unlikely he would work out hard and come to spring training at 290-300. Maybe. There is more to being in shape than losing weight. I’ll see what he brings to Spring and how he performs next season. That said, I think your earlier 260 is completely unrealistic if not impossible. When was he 260? When he was still growing. He is not going to be 260 again, imo. If you read my comment, Carole, you will see that I said 260...something.That is anything under 270.Let's see what he is when he reports to spring training.Maybe he will surprise some of us and report in great shape and tear it up next year.I would love to see that, however, will wait to see it. I think 280 is as low as he can go. I think weight is always an issue. Always. And not just for Sano and all athletes (especially athletes) but for everyone. It is hardly ever easy to control one's weight in our gluttonous culture, where now over 70% of Americans are either overweight or obese. But it can be done. It just takes desire and focus and work. I wish him self control and discipline, and a 2019 that makes him a superstar. I said weight isn't an issue if he is jacked and has worked out all winter. I will add that if he is 260 and well conditioned WEIGHT IS NOT AN ISSUE.HIs is issue wasLACK OF CONDITIONING more than it was his weight.